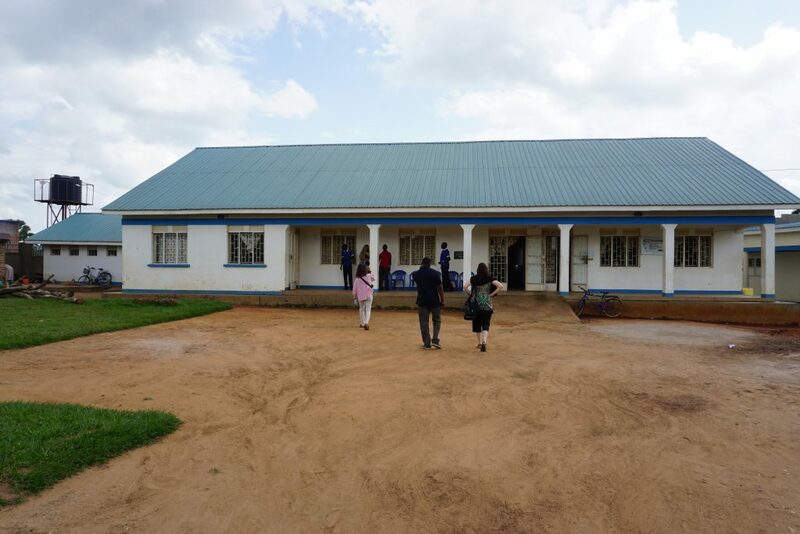 Take a tour with GFC as we visit Hope and Peace for Humanity, a grassroots organization dedicated to transforming the lives of conflict-affected youth in Uganda. If you were to visit the Gulu district today, you wouldn’t know it was once devastated by war. A developing community about 300 kilometers north of Kampala, Gulu is home to hotels, restaurants, hospitals, schools, and markets. At first blush, there don’t appear to be any remnants of the two decades of terror that the Lord’s Resistance Army inflicted on the community. But beneath the surface, evidence of the community’s traumatic past persists. 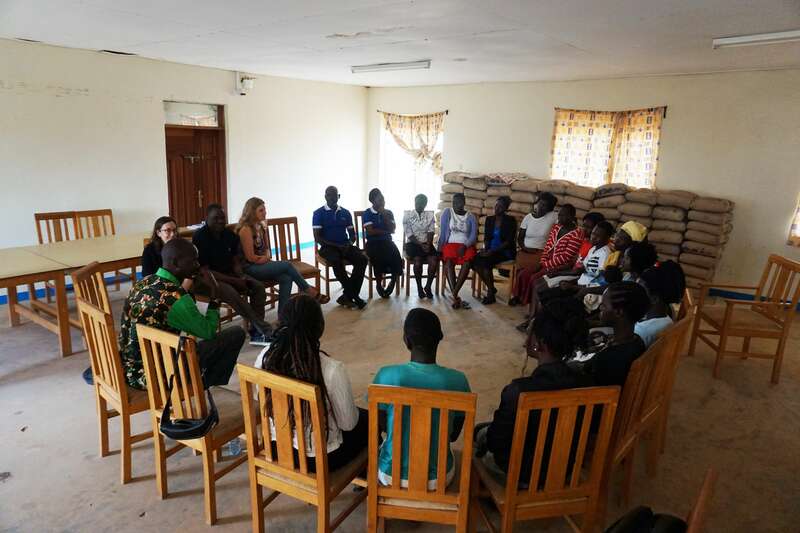 Above: Girls affected by the LRA conflict speak with staff from GFC and Hope and Peace for Humanity. A generation of young people missed out on going to school. Many lost parents or siblings in the violence; thousands were themselves forced into combat, child marriage, or sexual exploitation, and remain haunted by their memories of the war. Without an education or vocational skills, they struggle to gain traction as they enter adulthood, despite being eager to move beyond the past. 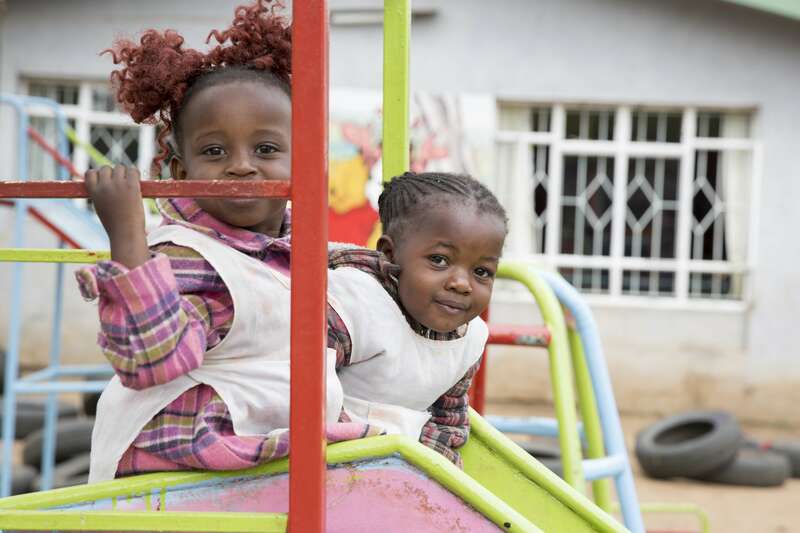 GFC partner Hope and Peace for Humanity (HPH) focuses on these youth—particularly girls and young women—and strives to improve their living conditions and increase their independence through education and training. 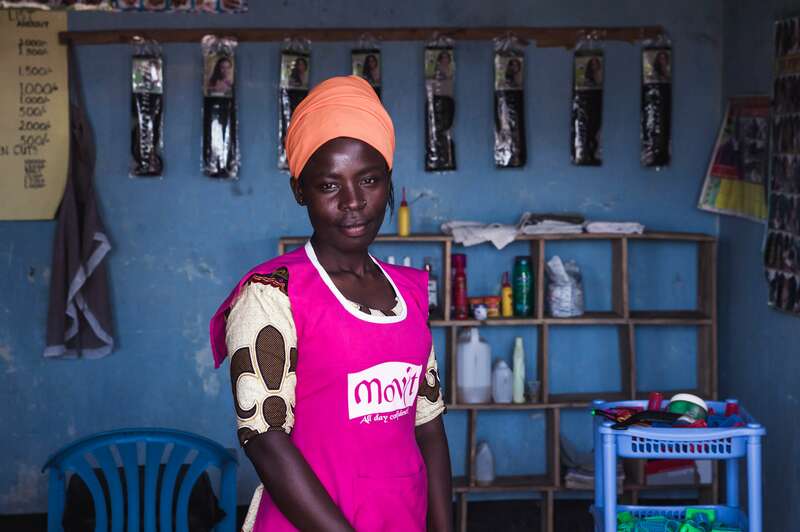 HPH is one of seven organizations that GFC supports in partnership with the MacArthur Foundation, through the initiative Unlocking Girls’ Potential in Conflict-Affected Areas of Uganda. We provide these partners with organizational strengthening, capacity development, and flexible funding to bolster their work on strengthening social safety networks for adolescent girls and young women in the country. Each addresses cross-cutting issues by implementing interventions related to education, vocational training, and entrepreneurship. 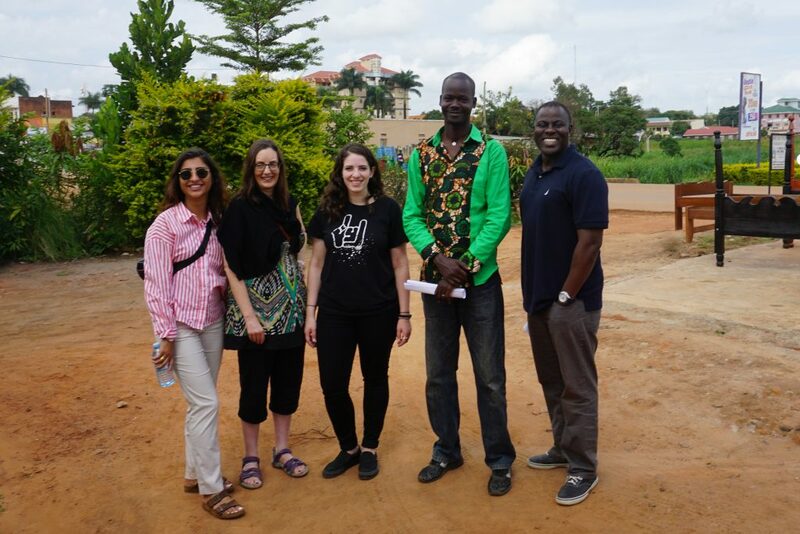 On a recent site visit, GFC staff had the opportunity to see HPH in action and meet some of the girls and young women who participate in the program. 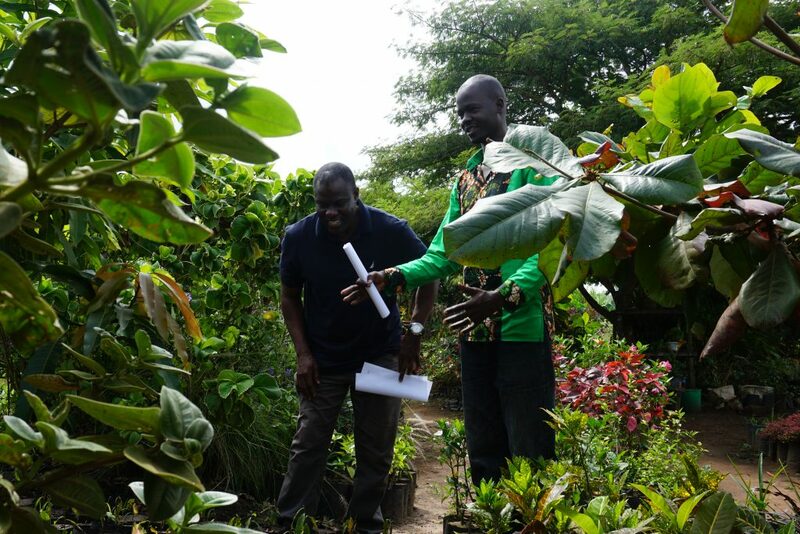 When visiting a partner in the field, seeing the programming is only one part of the agenda—we also take time to sit down with the partner’s director and staff, go over financial paperwork, review work plans, and discuss recent accomplishments and challenges. 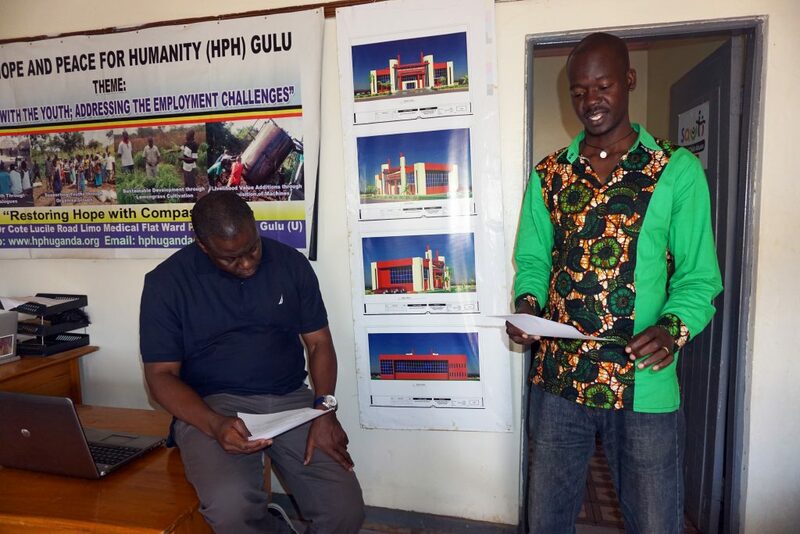 Above: HPH director Godfrey Canwat (green shirt) meets with GFC staff to discuss challenges and review the organization’s systems and structures. 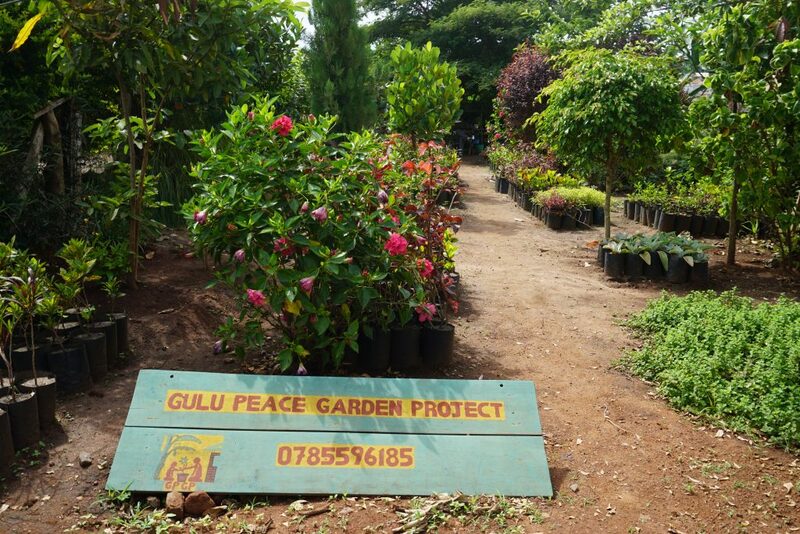 We also took a few minutes to visit the Peace Garden across the street, where HPH staff grow and sell produce, flowers, and plants to generate income for the organization. 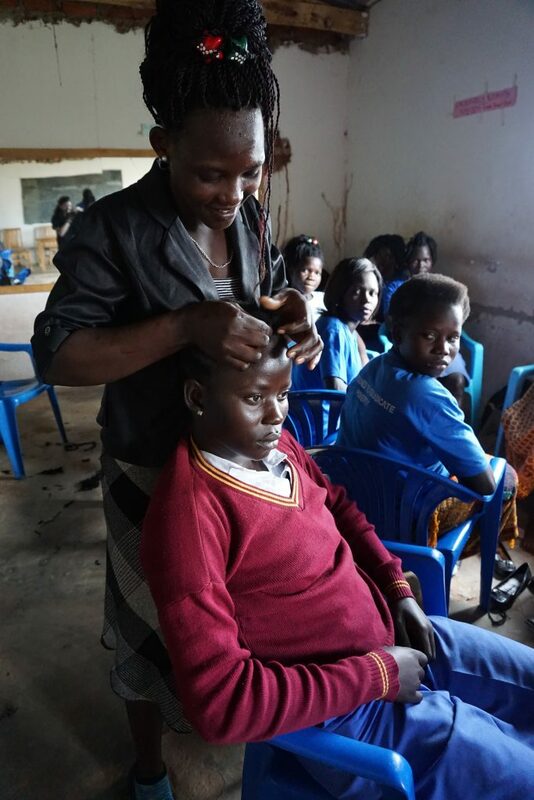 Then it was just a short trip to the Gulu War Affected Training Center, where HPH helps girls get hands-on training in skills like hairdressing, catering, and tailoring. First we met the new cohort of girls entering the program. The girls were quiet at first, but soon they began talking about why they joined the program. Many said they want to learn a new skill and start their own businesses. Some said they need a way to support themselves and their young children. The girls also had questions about the curriculum and what kind of uniforms they would wear. 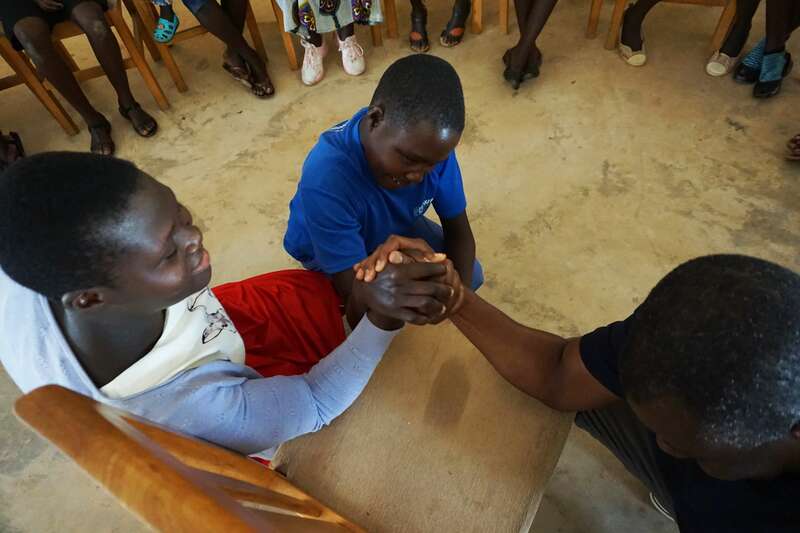 At the end of our session, a friendly arm-wrestling competition had everyone smiling! We then joined another cohort of girls who are already engaged in the program, several of whom were practicing their new skills. 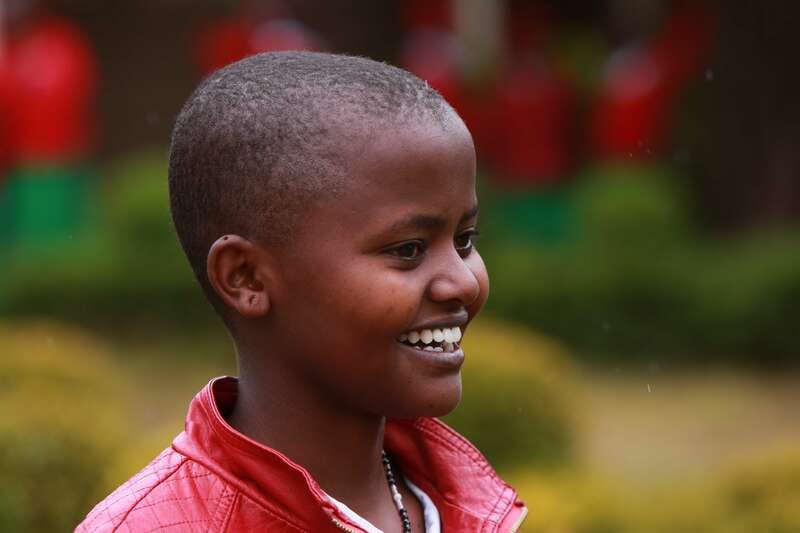 HPH has also helped many of these young women go back to school, providing support for school fees and materials, as well as counseling to help them overcome past trauma. By working closely with schools—conducting teacher trainings, constructing libraries and classrooms, organizing educational clubs—HPH helps to increase school enrollment and improve students’ academic performance. 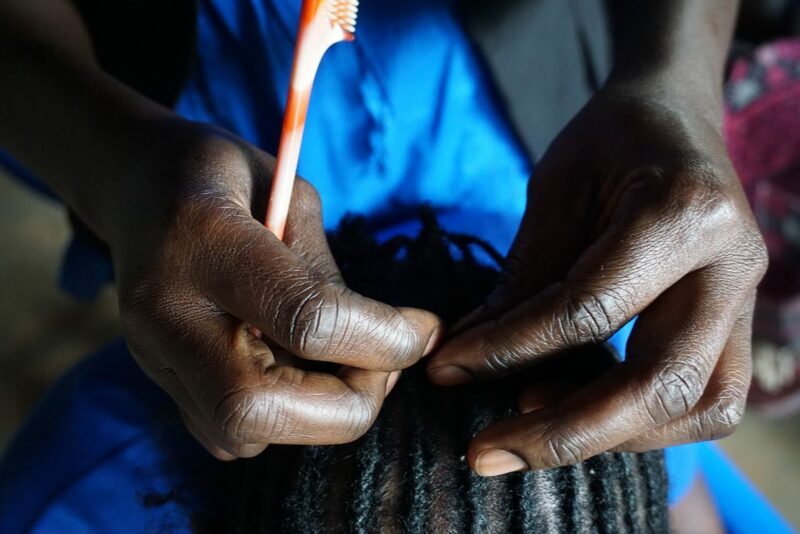 Above: Alanyo, age 17, has her hair styled by Babra, age 20, at a vocational training center for youth affected by conflict in Gulu, Uganda. Together, all of these services help restore hope to youth in the Gulu community. It’s just one of HPH’s projects. The organization also runs healthcare initiatives, an accelerated education program for primary-school aged children, an early childhood development program, and an economic empowerment program for parents. Last year, HPH reached more than 1,300 young people across three districts in Uganda.